THE WITHAM . SOLD OUT . THE BEGGAR'S THEATRE . SOLD OUT . ARTS CENTRE . SOLD OUT . PHOENIX THEATRE & ARTS CENTRE . SOLD OUT . THE RADLETT CENTRE .. SOLD OUT . COURT THEATRE .. SOLD OUT . SPRING ARTS & HERITAGE CENTRE .. SOLD OUT . KOMEDIA . SOLD OUT . THE KING'S THEATRE . SOLD OUT EXCEPT DRESS CIRCLE UPPER CIRCLE AND BALCONY . NORDEN FARM . SOLD OUT . HERTFORD THEATRE . SOLD OUT . THE HORSEBRIDGE CENTRE . SOLD OUT . THE HARLEQUIN THEATRE . SOLD OUT . WYLLYOTTS THEATRE . SOLD OUT . THE LIGHTS . SOLD OUT . THE REGAL . SOLD OUT . ARC . SOLD OUT . THEATRE ROYAL . SO CLOSE . THE HAWTH THEATRE . SO CLOSE . CUTTY SARK STUDIO THEATRE . SOLD OUT . FOREST ARTS CENTRE . SOLD OUT . HAZLITT THEATRE . SOLD OUT . THE SPOTLIGHT . SOLD OUT . THE ROSES THEATRE . SOLD OUT . TIVOLI THEATRE . SOLD OUT . THE RHODES THEATRE . SOLD OUT . LIBRARY THEATRE . SOLD OUT . 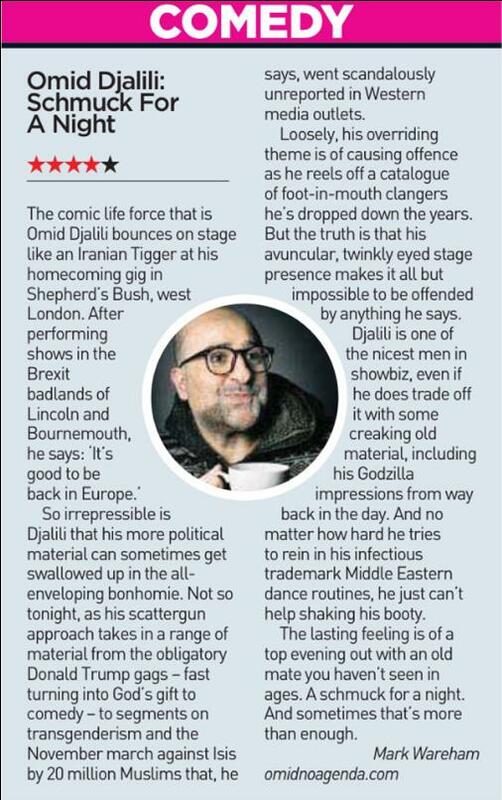 OMID PERFORMING AT THE EDINBURGH FRINGE. SHOWS START @4PM. 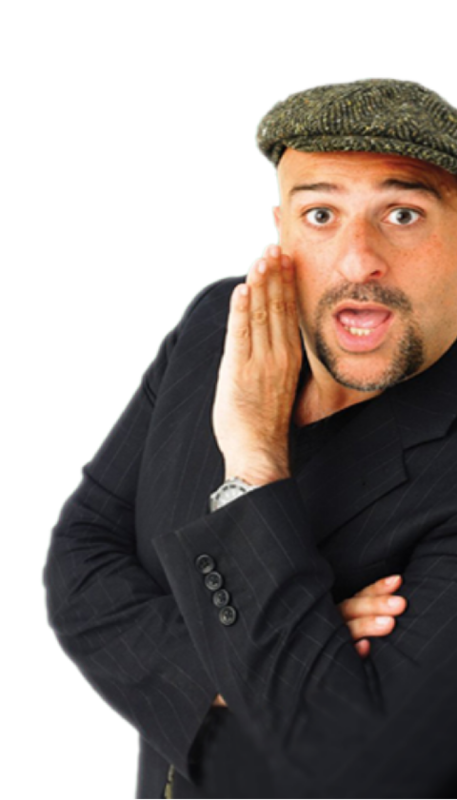 RADLETT CTR (OMID DJALILI LIVE!) . SOLD OUT . BECK THEATRE . SOLD OUT . CORNERSTONE . SOLD OUT . LOWTHER PAVILION . SOLD NOWT . GUILD HALL . SOLD OUT . GALA THEATRE . SOLD OUT . BREWHOUSE . SOLD OUT . OCTAGON THEATRE . SOLD NOWT . CORN EXCHANGE . SOLD NOWT . THEATRE ROYAL . SOLD NOWT . PLAYHOUSE . SOLD NOWT . WULFRUN HALL . SOLD NOWT . COURTYARD . SOLD OUT . PRINCES HALL . SOLD NOWT . SPA PAVILION . SOLD OUT . LIGHTHOUSE . SOLD NOWT . PALACE THEATRE . SOLD NOWT . GRAND THEATRE . SOLD NOWT . MUNI THEATRE . SOLD OUT . OPERA HOUSE . SOLD NOWT . THE FORUM . SOLD NOWT . THE BERRY THEATRE . SOLD OUT . HUNTINGDON HALL . SOLD OUT . PERFORMING ARTS CENTRE . SOLD OUT . ALBAN ARENA . SOLD OUT . ASSEMBLY HALL . SOLD OUT . MILL ARTS CENTRE . SOLD OUT . FARNHAM MALTINGS . SOLD OUT . SOUTH HOLLAND THEATRE . SOLD OUT . GULBENKIAN . SOLD OUT . GULBENKIAN . SOLD NOWT . INTERCONTINENTAL HOTEL . SOLD OUT . SAVOY THEATRE . SOLD OUT . OAKENGATES THEATRE . SOLD OUT . MILTON KEYNES THEATRE . SOLD OUT . DORKING HALLS . SOLD OUT . SHEPHERDS BUSH EMPIRE . SOLD OUT . WYVERN . SOLD OUT . THEATRE SEVERN . SOLD OUT . GORDON CRAIG . SOLD OUT . THE CENTRAL THEATRE . SOLD NOWT . CADOGAN HALL . SOLD OUT . PYRAMID & PARR HALL . SOLD NOWT . GRAND OPERA HOUSE . SOLD NOWT . LYCEUM THEATRE . SOLD NOWT . ALHAMBRA . SOLD OUT . WHITE ROCK . COLD SNOUT . THEATRE ROYAL . SOLD OUT . THE MALTINGS . SOLD OUT . TYNE THEATRE & OPERA HOUSE .SOLD OUT. QUEENS HALL . SOLD NOWT . PICKAQUOY THEATRE . SOLD NOWT . ASSEMBLY ROOMS . HOLD POUT . EDEN COURT THEATRE . SOLD NOWT . CONCERT HALL . MOULD SPOUT . HIS MAJESTY’S THEATRE . SOLD NOWT . ROTHES HALLS . OLD TROUT . HALL FOR CORNWALL .SOLD OUT. CITY HALL . SOLD NOWT . NEW VICTORIA THEATRE .No one would have believed in the final years of the nineteenth century that human affairs were being watched from the timeless worlds of space..
TOWN HALL .OO ME MINGE. MILLENNIUM FORUM .F’ENIAN TURK UP OFF HIS HOLE. BLACK BOX THEATRE .ALEX HIGGINS. VICAR STREET .MICHAEL D HIGGINS. PAVILION THEATRE .LOST TWO DURING INTERVAL RIP. ASSEMBLY HALL .UP ROYAL SPOUT. G LIVE .SOLD MOST + went great. REGENT THEATRE .HIGH SIXES ALL ROUND. SYMPHONY HALL .TREVOR FRANCIS 1977. COLOSSEUM.LESS JOHN BARNES MORE KENNY JACKETT . GRAND THEATRE.EXPECTED LEIGHTON JAMES GOT ALAN CURTIS. ST DAVID'S HALL.EXPECTED ROBERT EARNSHAW GOT ZIDANE. THE CRESSET . PETERED OUT . NYC's Premier Stand-Up Comedy Nightclub! Thusday 2 Nov 2017 . QUIET RIOT . Friday 3 Nov 2017 . WORD IS OUT. 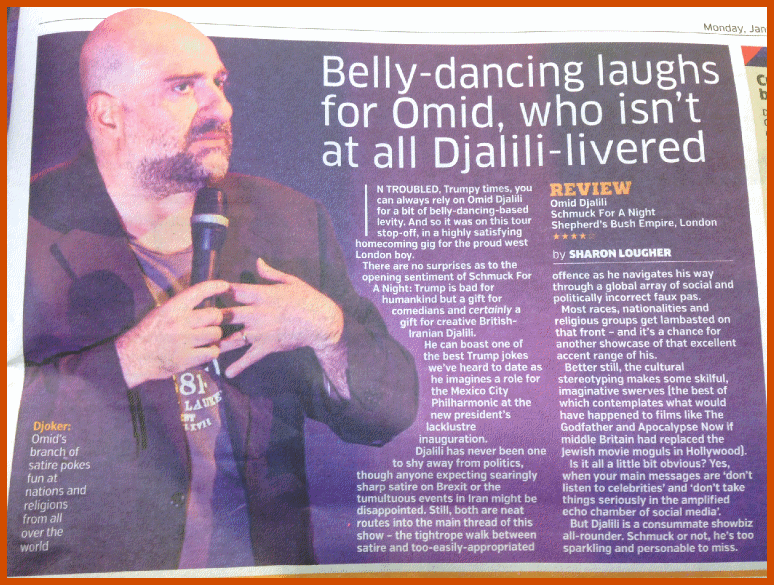 Saturday (two shows) 4 Nov 2017 . SOLD OUT. Sunday 5 Nov 2017 . SOLD OUT. MUSIC HALL — SHEIK RATTLE AND ROLL . MUSIC HALL — SOLD OUT. FLORAL PAVILLION . SOLD POTS . CIVIC CENTRE . RATHER GOOD. THE ARTS CENTRE . SOLD OUT . CAMBERLEY THEATRE . SOLD OUT . HARLEQUIN THEATRE . RED HOT. TIVOLI THEATRE . ENDORSED BY DORSET . SOUTH HILL PARK ARTS CENTRE . SOLD OUT . ARTS HOUSE . SOLD OUT . THE POINT . SOLD OUT . ARTS DEPOT . SOLD OUT . THE HAWTH THEATRE. MY KINGDOM FOR A HAWTH. THE ROSES THEATRE . ALMOST BUT NOT QUITE - SHOULD HAVE BEEN. THE CORE . SOLD OUT . LEICESTER SQUARE THEATRE . SOLD OUT . FESTIVAL THEATRE . SOLD OUT . KING'S HALL . SOLD OUT . THE ATKINSON . SOLD OUT . LAST PERFORMANCE OF THE SUMMER..! WILTON’S . SOLD OUT . ST JAMES ASSEMBLY HALL . SOLD OUT . THE BRENTWOOD CENTRE . SOLD OUT . CASTLE THEATRE . SOLD OUT .